It has been uncomfortably hot over the past few weeks! There is nothing I felt like doing except to soak myself in the bathtub until my skin creases (a pity I do not have a bathtub actually). Wherever we went, it was humid, and we get hot and sticky all over. Yucks, it doesn't feel good at all. For this reason, I did not step into the kitchen very much. Most of the time at home was spent hiding in the aircon room, either facing the computer, the TV, a book or on the bed. 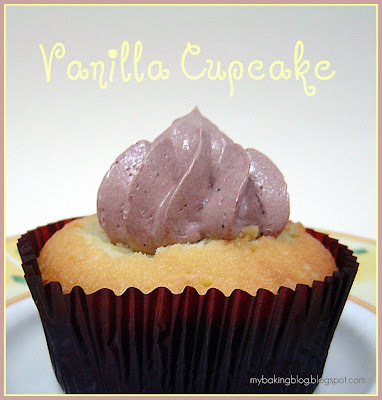 Just a few days ago, I suddenly remembered the bake for April at Sweet & Simple Bake is Vanilla Cupcake. Great idea, it's a classic and always a hit. I realised the recipe is the same as the one we had done for Halloween. But no problem, I don't mind doing it again since I enjoyed them the previous time. 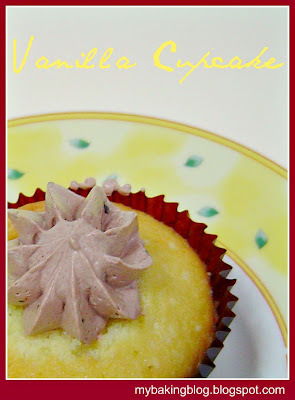 I decided to keep my vanilla cupcakes real simple. Firstly, my family members do not like stuff which are overly sweet. So, I replaced the frosting recipe with some Swiss Meringue Buttercream I have, which we find less sweet. I also used soy milk in place of regular milk. It was wonderful. With a cup of iced chocolate, it was simple, comforting and satisfying. Bimmer, they look wonderful and I love the little swirl adorning the cupcake! Thanks for taking part and hope you will join us again in our next bake. Hi Bimmer, wow oh wow - absolutely gorgeous!! Vicky the cup cake looks wonderful with the presentation itself..can imagine the flavour !! A perfect swirl on the top! Decorative and satisfies those who do not like too much frosting. (Not me - love the frosting! )Great job. Thanks for your tip on slicing the domes off the cupcakes. I loe your decoration ! I wish I had thought of just doing a swirl! We ate so many cupcakes and tons of icing! lol!